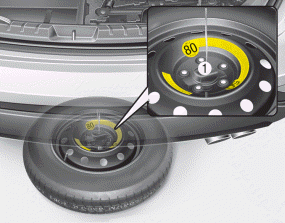 Your spare tire is stored underneath your vehicle, directly below the cargo area. 2. Find the plastic hex bolt cover and remove the cover with coin or flathead screwdriver. 3. Connect the socket and wheel lug nut wrench. 4. Loosen the bolt enough to lower the spare tire. Turn the wrench counterclockwise until the spare tire reaches the ground. 5. 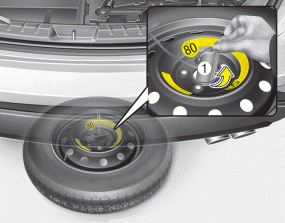 After the spare tire reaches the ground, continue to turn the wrench counterclockwise, and draw the spare tire outside. Never rotate the wrench excessively, otherwise the spare tire carrier may be damaged. 1. Lay the tire on the ground with the valve stem facing up. 2. 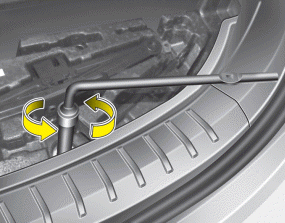 Place the wheel under the vehicle and install the retainer (1) through the wheel center. 3. Turn the wrench clockwise until it clicks. 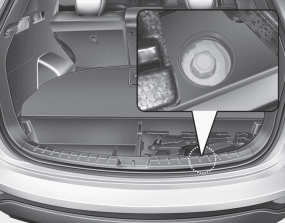 Ensure the spare tire retainer is properly aligned with the center of the spare tire to prevent the spare tire from “rattling”. Otherwise, it may cause the spare tire to fall off the carrier and lead to an accident.